With his gaze fixed on a row of pale tree seedlings struggling to sprout, Nelson Egho cuts the figure of a concerned man. He planted the seedlings in the hope that they would grow into trees in what was formerly a thick forest reserve. Now the Urhonigbe Forest Reserve in the Niger Delta is all but barren grassland. Like other trees that once had their roots here, and have since been cut down for firewood, logs and land, Egho’s saplings are threatened by a host of factors which he is fighting to keep at bay. “For the past two weeks now we have been trying to clear the lines in which we planted tree seedlings, but due to a fire that gutted the area last time, we needed to replace the seedlings that were burnt,” he says, a drop of sweat running down his face. Egho’s challenge is similar to that encountered by the other interest groups, saddled with the unenviable task of protecting what remains of Urhonigbe Forest Reserve, and restoring the sections that have been wiped out. 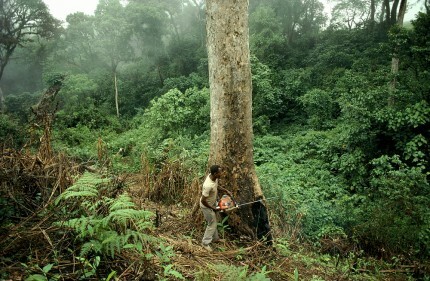 According to the Nigeria Conservation Foundation, the forest provided habitat for at least 11 types of mammals and 41 varieties of bird species before it was cut down between the early 1920s and 2006 when action began to stop its obliteration. Chris Ameh, a site officer at the reserve notes that the forest was so dense and rich that it was classified as a strictly protected nature reserve by the United Nations. Ameh lamented that some efforts being made at regeneration were being thwarted by annual bush burning, previously caused by cattle Fulani herdsmen but now largely caused by local farmers, and rodent hunters, whose destructive nocturnal activities are hard to check. “They leave the place with fire, and it razes what we have planted, it is very frustrating,” he said. On the whole, conservationists have identified deforestation, uncontrolled subsistence farming, illegal hunting, wildfires and over grazing as some of factors that have undermined efforts being made to regenerate the reserve. All this notwithstanding, a Biodiversity Action Plan (BAP) is being vigorously implemented to save the forest. Funded by the Shell Petroleum Development Company (SPDC), the BAP is being touted as the means by which an efficient and sustainable management of natural resources on offer can be carried out. The plan emphasises the importance of the participation of the communities around the forest. Thus the project established the Forest Management Committee and the Grassroots Consultative Committee in communities around the reserve. The eight-person management committee includes the community head, head farmer, youth, men and women leaders in each of the communities around the forest reserve. Members of the grassroots committee are nominated from among management committee. For Professor Emmanuel Obot, Executive Director of the Nigeria Conservation Foundation (NCF), who advocates a bottom-up approach to environmental management, making the local people the centrepiece of the efforts to save and regenerate the Urhonigbe reserve, is crucial. Recently, Edo State became the first among the 36 states of the Nigerian federation to pass a biodiversity law. This novel piece of legislation, as far as Nigeria is concerned, has provided legal backing for the work being done to protect biodiversity in Urhonigbe. Michael Uwagbae, who hails from one of the communities around the forest, is the Biodiversity Action Plan Project Manager at the reserve. He says on the strength of the biodiversity law, poachers and other elements carrying out illegal and damaging activities in the reserve are being checked, and brought to book. These measures notwithstanding, the demand for bush meat from forest animals has proved extremely difficult to combat. A restaurant owner in the area says although she and her customers miss the ‘real bush meat’ from the forest, which is tastier than that from animal husbandry, everyone is trying to cope. A traditional ruler in the community, the Enogie n Ugo- Niyekorhuawon, E.O Ogiugo, who also reiterated his people’s undying love for bush meat, explained that he believed that gradually, the message of sustainable management of the forests would catch on.